Need a quick and easy dinner idea? This is your new favorite recipe. I originally made this during a kid’s cooking class at my dietetic internship, and it was a huge hit among both the kids and the adults. *Or fresh herbs — just triple the amount called for if using fresh. 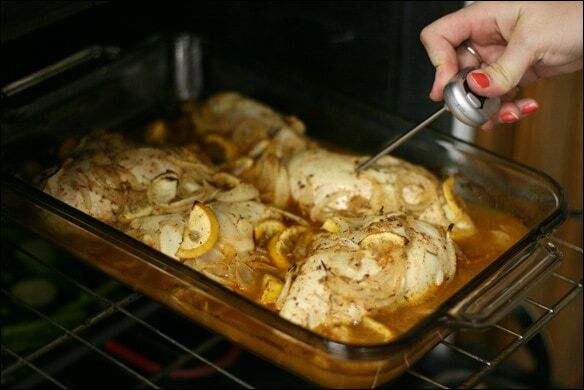 Spray 9″ x 13″ baking dish with non-stick cooking spray, place raw chicken in baking dish. Mix lemon juice, orange juice, vinegar, sliced lemons/oranges, oregano, rosemary, and chili powder. 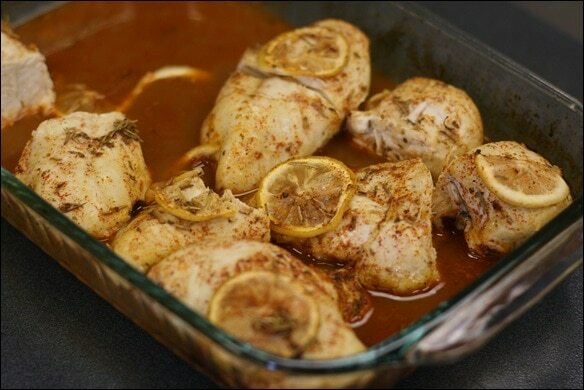 Pour over chicken, cover and marinate in refrigerator 30 minutes to 1 hour. Remove from fridge; sprinkle with salt, pepper and paprika. Cover with foil and bake at 350 degrees F for 30 minutes. Uncover and bake 30 minutes more. Recipe and nutrition information originally developed for Cook Smart, Eat Smart — NC Cooperative Extension! Check out the original post with lots more commentary/photos: Sunkist Valencia Orange Lemon Chicken Recipe.